Orange Marmalade or… Blood Orange Marsala Marmalade! I love the addition of Marsala wine to this recipe because it adds a musty rich sweetness. And you get to use the freezer spoon trick to see if your marmalade has jelled! 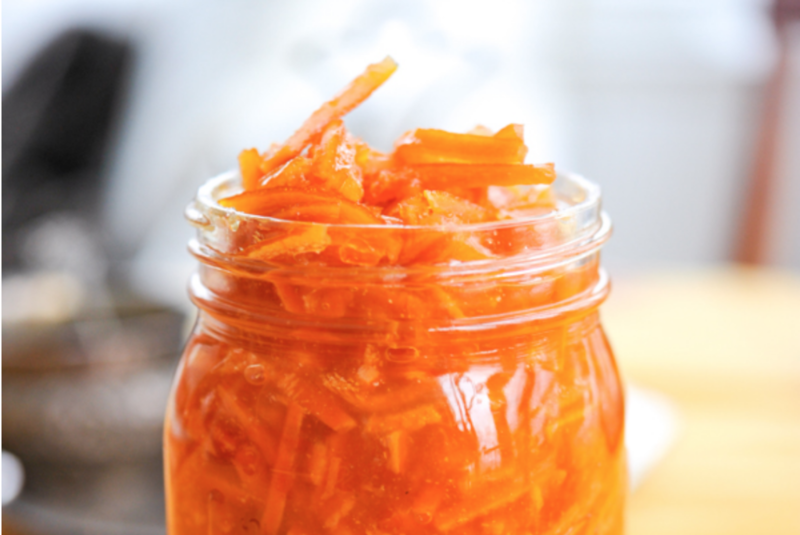 And you it’s really such an amazingly easy recipe that celebrates the natural pectin in the orange. 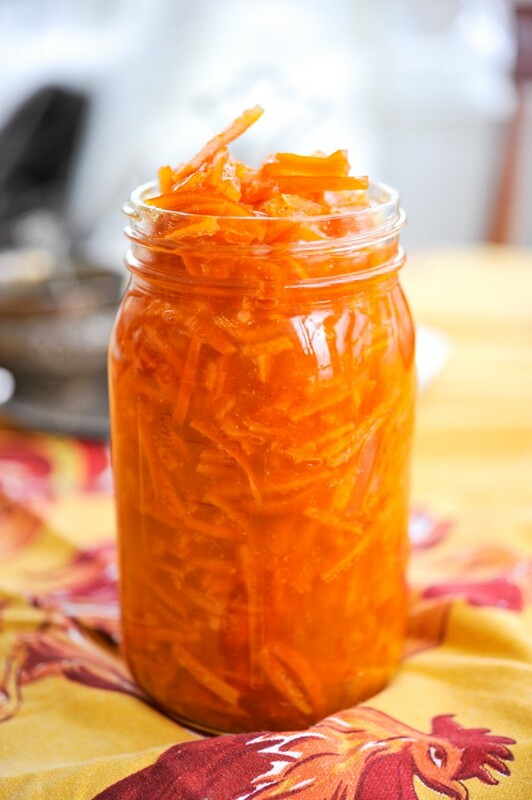 This marmalade will look beautiful on your shelves for a whole year, until oranges come again. And they make a wonderful gift in the winter months when it seems like fresh fruit is a distant memory. Do you have a favorite marmalade or jam that you make? Share it with me in the comments on by tagging me on instagram @GeorgiaPellegrini. Place the oranges in a large pot and cover with 8 cups of cold water. Bring to a boil for 5 minutes, then remove from the heat. Pour off and discard the water. Repeat this process 2 more times so that the oranges have been blanched 3 times total. Cover the oranges a fourth time in 8 cups of cold water and let them simmer, untouched, over low heat for about an hour, until the peel can be easily pierced with a fork. Remove from the heat. Transfer the oranges into a large bowl with a slotted spoon and let them cool until they are easy to handle. Reserve the orange water in the pot for later. While the oranges are cooling, place 2 or 3 tasting spoons in the freezer (they will be used to check whether your marmalade has jelled). Cut the oranges in half and scoop out the inner flesh, pith, and seeds with a spoon and reserve them in a bowl. Set the peels aside. Set a fine-mesh strainer over the pot of orange water and add the orange flesh, pith, and seeds. Press with a spatula or large spoon to extract as much liquid as possible. Then gather the flesh, pith, and seeds in some rinsed cheesecloth, tie it with twine, and set it inside the pot of liquid. Slice the peel into strips that are ?-inch thick and ½-inch long and place them into the pot of liquid. Turn the heat to low and simmer the orange liquid and sachet for about 10 minutes. Add the sugar and bring the mixture to a boil for 30 minutes, or until it thickens and reaches a setting point. 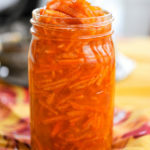 To test this, remove one of the tasting spoons from the freezer and add a drop of marmalade to it (do not dip it in the pot), then place it back in the freezer. After 5 minutes remove it and hold it vertically to see if the marmalade runs or is set. If it runs, let the mixture cook on the stove for another 5 minutes and try again with another frozen spoon. Remove the pot from the heat and skim any foam from the surface. Let it sit in the pot for 20 minutes to cool, then stir in the marsala wine. 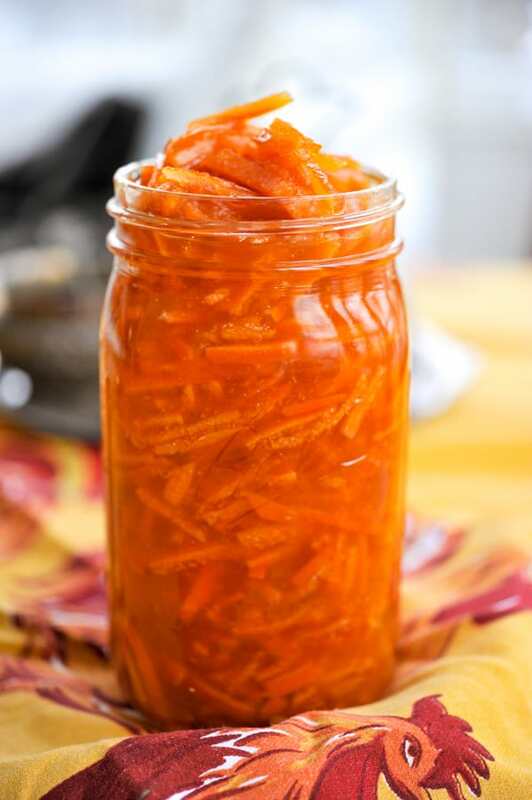 Ladle the marmalade into jars and store them in the refrigerator for up to 6 months. Alternatively, process the marmalade in a hot-water bath for 10 minutes. It is best when consumed within 12 months of canning.